Double Board Certified Dr. Wayne Lee in Tampa Bay understands that our face is affected by changes in our skin, facial shape, and the volume and fullness that was higher in the cheek region during younger years slowly descends over time. In addition, deepening fold lines around the mouth and nose also are a direct result of aging. These changes lead to loss of jaw line definition creating a more oval-shaped face. Often, excess skin and muscle in the neck region accentuates facial aging by creating banding or cords within the neck. Sun exposure, bone structure, amount of fatty tissue and genetics contribute to the extent of facial aging that each person experiences. The most effective and long-lasting treatment for these common signs of facial aging is the facelift. View before-and-after pictures of real patients of Dr. Wayne Lee. The facelift attempts to correct the signs by addressing all areas of the face and the neck simultaneously. The modern facelift can achieve this effect by re-suspending the connective tissue layer of the face, yielding a more long-lasting and natural facial rejuvenation. 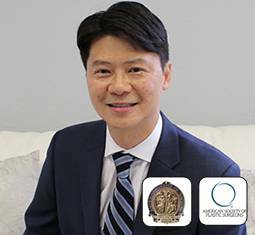 Dr. Lee’s goal is to always tailor each facelift operation to the specific needs of each patient.